In this post, we will explore innovative illusion show concept ideas. 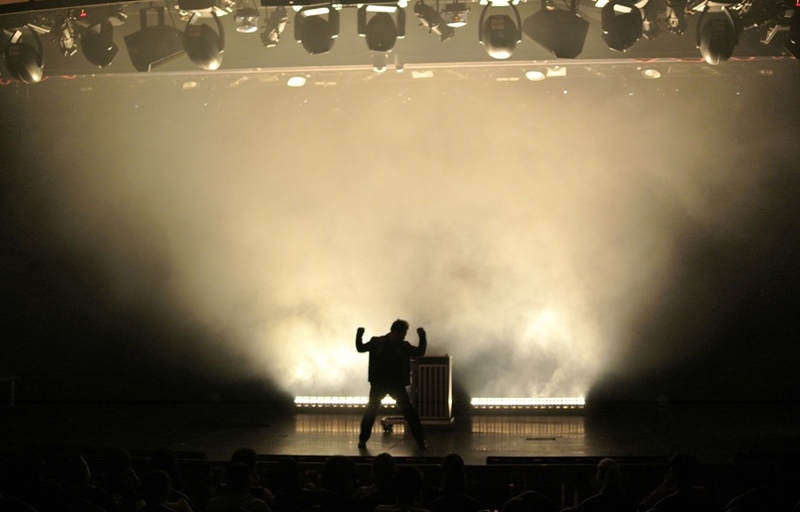 Most illusion shows follow a similar formula: Open with an illusion, then alternate between stage/ stand-up routines till the climax which is the biggest or most impressive illusion. I would say most of my general shows follow this structure although I have distinct changes in theatrical pacing in the two halves of my show. However, there are gigs where a more bold and innovative show structure or concept can be explored. Over the years, I have produced and staged several concept illusion shows that worked for the projects I was working on at that time. This is one of the most straight forward devices to utilize to give a concept to an act or show. The show is presented as a story with the magic & illusions supporting the story. This is quite popular in Europe, especially for shows that play in theatres. Storyline short acts are more common than full magic & illusion shows with a central storyline. Good scripting and direction is required to make any storyline concept work. Production value in terms of stage sets, costumes, props and lighting might also be required to create the right theatrical experience. Some magicians and illusionists also draw on their own lives and perform illusions and effects that represent symbolic moments in their lives. One story concept that I have not seen used (to my knowledge) in an illusion show is the Murder Mystery plot. This is like a game of “Clue” or a “Who Dunnit?” show. A crime of sorts is committed and the storyline advances the plot. At the end, the murderer or criminal is revealed, usually with a twist ending. This plot can be made into an interactive show where spectators are assigned roles and the audience has to guess who the murderer or criminal is. Naturally, magic effects & illusions are used to tell the story. A common show concept is to build the show around a theme. The themes are limited to your imagination and creativity. A non-exhaustive list of themes includes; danger, fear, science, recycling, horror, technology, history, culture, pop culture, music or a specific era. For a themed show to be successful, the theme should have value, meaning, relate to the audience or have a motivation/ consequence for the presented magic effects. Please… for the love of all good things magical… Please do not build a show around a frivolous theme like a single colour. The Yellow Magician might appeal to kids for birthday party shows but does not have a place in a modern illusion show, in my opinion. This approach is akin to the concept of a running gag but with a big magical payoff at the end. The audience’s attention is constantly called towards an item on stage and finally something happens to it at the end of the show. At the the start of the show, the illusionist calls attention to a padlocked-trunk on a table/ raised stand at the side of the stage. He explains it contains something important that he will reveal to the audience at a later time. Throughout different points in the show between routines, different items are vanished including a cage of doves, a spectator’s watch, a bottle of wine and eventually a girl. Each time an item is vanished; the illusionist calls out a seemingly random single-digit number and asks the audience to remember the numbers as the show progresses. These four numbers are revealed to be the combination that opens the number padlock of the trunk. When the trunk is opened, the (vanished) girl reappears holding a birdcage in one hand, a bottle of wine in the other and the spectator’s watch around one wrist. This is an example of a story arc effect that I came up with but knowledgeable illusionists will be able to devise various methods to achieve this effect. Another example of a story arc effect presented in a close-up routine is Paul Gertner’s “Ring on Hourglass” effect that is the wrap-around effect that ties his act (of separate effects) together described in his book/ DVD “Steel & Silver”. This is an intriguing concept but requires skill and careful thought to pull off well. This concept can be intriguing to an audience only if presented well, otherwise it will come across repetitive and mundane. From a magic deception perspective, the benefit of performing the same effect with different methods and presentations is that they will cancel out the methods of the illusions in the minds of the audience. The idea is to present different versions of the same effect in a single show. While it is unlikely it will work for a long show, say 30min or more, it will work for a 15min show or as one half of a fuller show. For example, you may want to perform a series of progressive suspensions and levitations that increase in strength of effect and deceptiveness. So, you might start with a “Broom Suspension”, then a “Ladder Suspension” and finish with an “Asrah Levitation” that ends with the kicker vanish of the girl. One idea I came up with years ago was to present different sawing illusions such as the “Thin Model Sawing”, “Modern Art” and “360 Sawing” as one themed segment in a show. This technique is most commonly seen used on TV magic shows where the episode or special ends with a big illusion or stunt. Throughout the episode, different elements of the stunt are highlighted or clips of preparations/ training are shown. Often, parts of the props or set-up are also introduced. These elements are used to hook the viewers and keep them captivated so they stay to the end of the show. Many magic & illusion shows are interactive in nature, some more than others. Stand-up performers tend to have quite a fair bit of audience interaction/ participation and close-up magic shows are almost always interactive. However, an illusion show is generally perceived to be a visual spectacle and audience participation is usually a small component of the show. A fully interactive illusion show can be novel and effective for the right audience. I present an illusion show with the concept of being highly interactive in innovative ways. While I am no means the first magician to create a magic show that is highly interactive, I do not know of a large-scale illusion show that is built and marketed around this concept. I also designed a lot of different audience participation and interactive acts for the show that go being the typical “helping the magician on stage.” The audience is involved in many different creative ways so that the content matches the show’s promo. If you try out any of the show concepts for your show, let me know how it goes. If you have any other suggestions that you think can add value to this post, let me know as well!